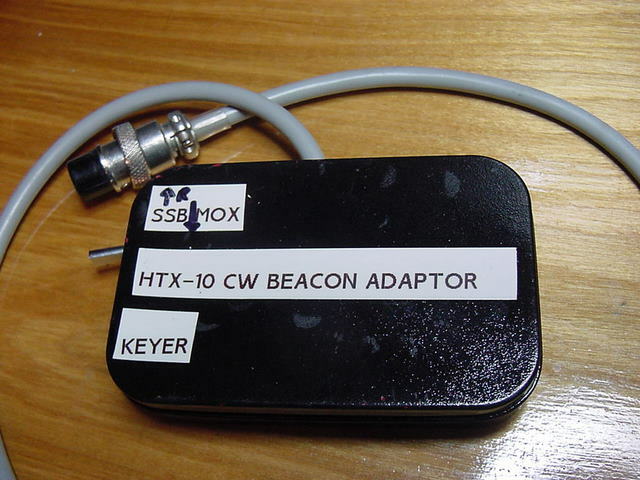 (8 January 2010) I have recently received reports of a chirp when the HTX-10 rig was keyed in the AM mode...... it must be a "quirk" in some rigs but not all...... Two of the three rigs I used in experiments before activating this page did not emit a chirp...a third rig when checked had a faint chirp on initial keying and would all but disappear when the message WPM exceeded 15 WPM. 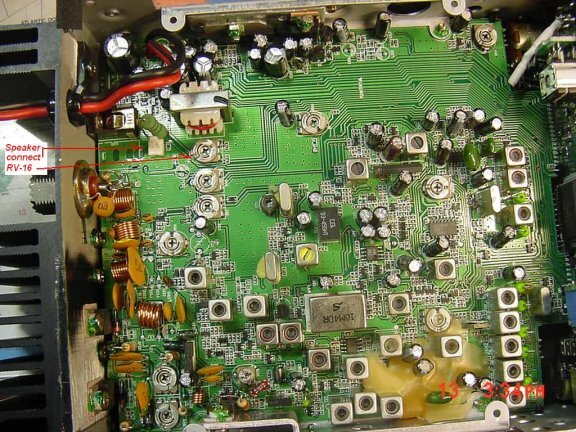 Please don't attempt these procedures if You are not comfortable working with electronic components....... Don't "screw up"..... You are at Your own risk..... These procedures have been tested & shown to work. 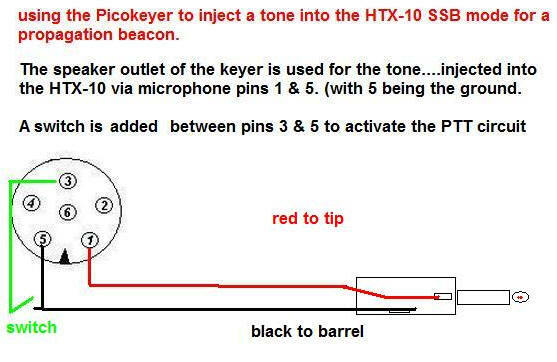 The HTX-10 can also be used as a beacon by injecting a tone with the rig in SSB mode.. 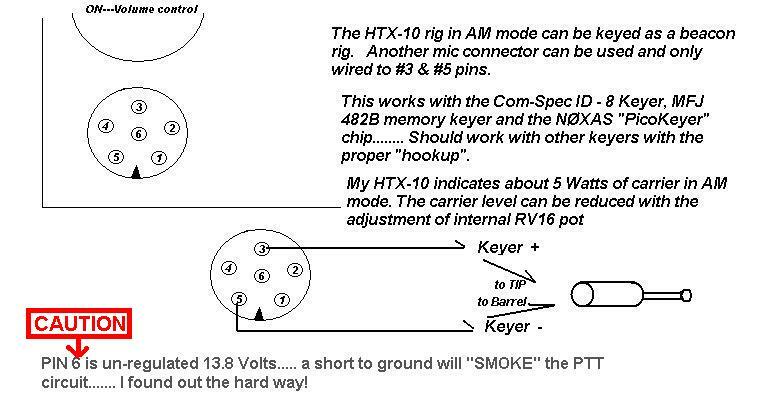 I am not responsible if You damage Your HTX-10 rig or cause it to emit spurious emissions........ I would suggest keeping the AM beacon power to three Watts or less........ 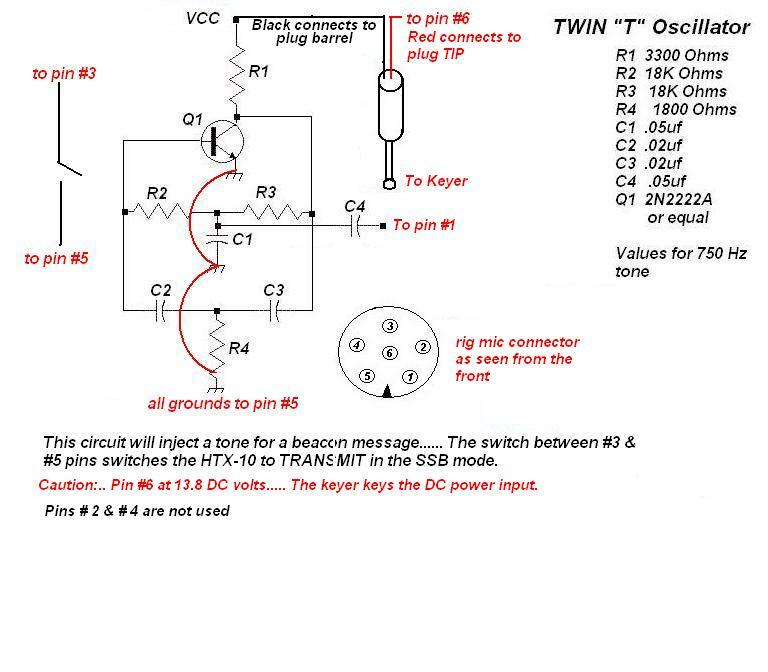 If the injected audio drives the SSB too hard a resistor or "pot" can be placed between C4 and pin # 1........... check the signal from a few blocks away with Your mobile rig........ I would suggest "backing off" on the mic gain to reduce the output to less than ten Watts. If the rig runs hot...... either use a less demanding "duty cycle" message and / or a muffin fan on the heat sink. I did not need to add resistance between the pin #1 and C4 and the tone was not overdriven with my rig. 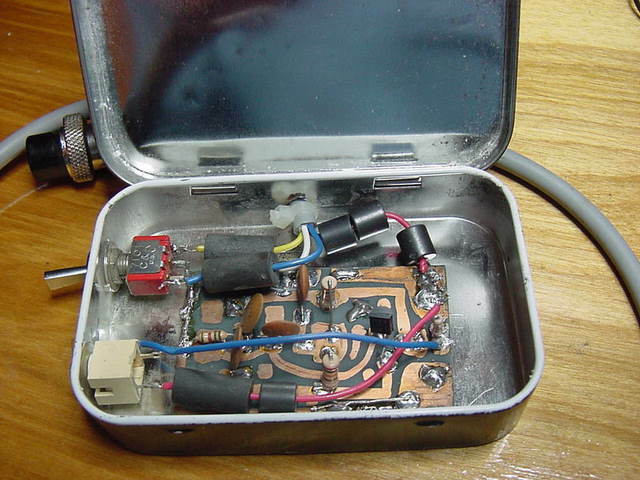 I operated the rig for about an hour on SSB with the injected tone setup and that the rig heated no more than if operated for an hour with QSOs. ........ 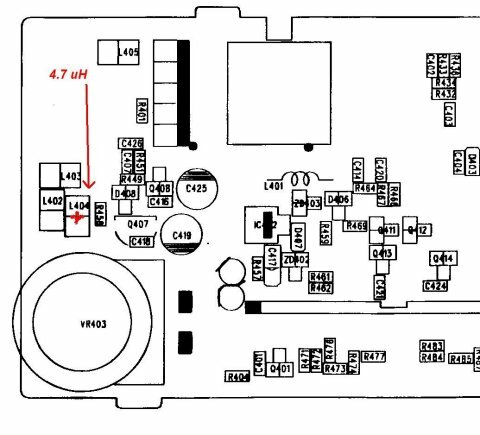 I did notice however, that with the HTX-10 in USB mode set on 28.550 MHz that the signal is picked up on approximately 28.549MHz....... could be that the tone is slightly higher than 750 Hz...... or just that the digital readouts of the two rigs were different.